As of November 5th Facebook has banned the like gates. This means businesses can no longer require people to “Like” a page before entering a contest or to receive a coupon. This was a common practice among marketers to gain “Likes” on Facebook pages. 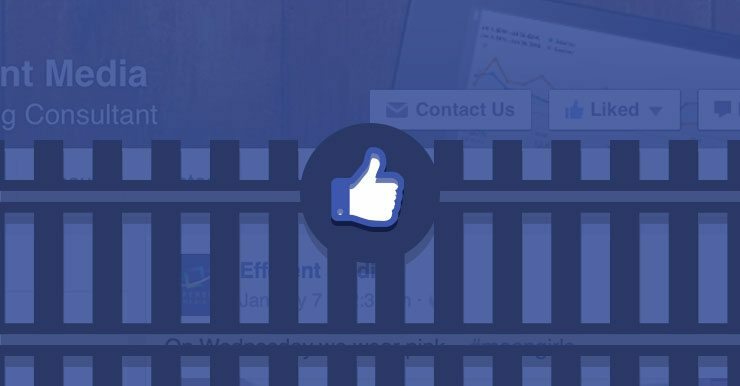 All hope isn’t lost there are still ways to get “Likes” on your business Facebook page. You’ll just have to be a bit more creative. These three tactics should get you going in the right direction. If you own a business chances are you have a pretty inclusive email list. Why not send everyone on that list a request to follow you on Facebook? Make sure not to send a boring email with the subject line “Like us on Facebook”. 33% of email recipients open the email based solely on the subject line. Make it exciting and eye catching. Also, in the email itself provide something of value, so that they’ll want to click through and find out more on your Facebook page. It can be anything ranging from interesting facts to a contest to funny pictures. You decide what content falls within your overall strategy and brand image. Another creative way to get people to like your page is to interact with other like-minded businesses on Facebook. You can do this by clicking “Edit page” in your Admin Panel and selecting “Use Facebook as Your Page”. Once you’ve done this like some companies pages that interest you. Make sure they’re not a direct competitor, but still in your market space. If you own a shop that repairs cars, it would be smart to interact with a shop that paints cars. Make sure the interaction is fun like you are friends. It shouldn’t come off sounding corporate. Not only are they likely to follow you back, but engagement with their page will drive up awareness for you amongst their followers and vice versa. Everyone involved wins, plus it’s easy and doesn’t take as much effort as other tactics to drive up likes. If you have a brick and mortar location, get the most bang for your buck and include a sign in your store to “like us on Facebook”. If you want to go a step further offer 5% off their next purchase, if they “Like” your page or “Like” a status, or something else on your Facebook. Chances are they’ll log onto their smartphone and do it on the spot! You don’t have to limit the signage to just by your register either. Put one in your storefront, you’ll be able to gain the attention of foot traffic. Also, why not put have an icon on your bags, or business cards? Those are things people take with them outside of your location and you’ll gain some extra attention. This all can be a big commitment, but if done right, signage will turn your offline community into an online community. There are plenty of other tactics besides these three suggestions to drive up your Likes, but these are a good start. If you don’t find one working jump to another, there’s no right way, or wrong way. It just depends on works for you and your business. We may not like all of Facebook’s changes (no pun intended), but we do have to live with them and find creative ways to work around them.